Australian filmmaker Keith Loutit received considerable attention for his series of timelapse videos, "Bathtub," which can be seen here. His work focused on using miniaturization to make large-scale objects appear like mere toys. Now based in Singapore, Loutit created "The Lion City" three years ago. Utilizing a different tilt shift technique than was used in his "Bathtub" series, "The Lion City" was shot with Nikon D3s, Nikon D4 and Canon 5D Mark II camera bodies. Lenses used for "The Lion City" include Nikon lenses from the 80s and 90s and large format bellows and Rodogon lenses for shots utilizing focus effects. The video was edited in Final Cut Pro and effects were added in Adobe After Effects. 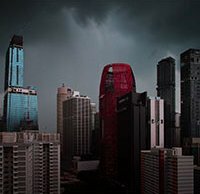 Now that you've seen "The Lion City," you need to see Keith's newest timelapse video from Singapore, "The Lion City II - Majulah." Not utilizing the same effects found in much of Keith's earlier work, his latest video showcases tremendously edited day to night sequences. Despite not using tilt shift and focus effects, the new video still employs very distinct perspective changes that give his video a special sense of depth. Particularly fascinating are the construction sequences which are so well-blended and processed that it looks as though buildings and structures popped up over the course of a single day. This is a must-see and unlike anything I've come across before. Be sure to watch it in HD! I can't wait to see what Keith Loutit does next. To see more of his work, visit his website.